I was so busy preparing for the expansion and then playing the expansion, that I haven't gotten a chance to update! So Failclysm is finally over and we can all just move on to bigger and better things. That particular expansion was just lacking for me and I couldn't bring myself to really get into it. Pandaria, however, has been amazing so far. The new continent is just absolutely breathtaking and I'm really enjoying the quests. They're a little different from what was done before and more work seems to have gone into them, making them more exciting and less of a chore to get through. 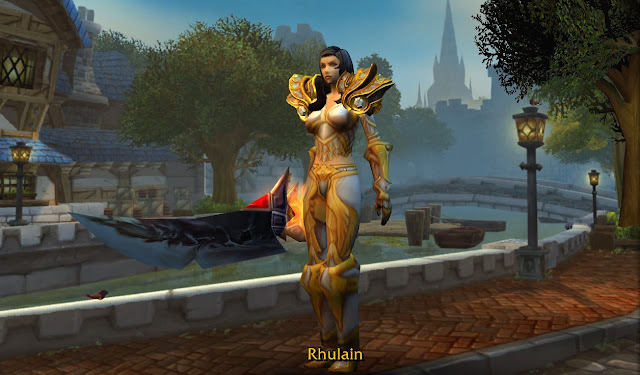 After some serious ADD on which character I wanted to level first, I decided to go with my tried-and-trusted paladin, Rhulain, who has been my main since just before Classic transitioned into Burning Crusade. As with all other expansions, when it comes time to level, I've swapped out my Prot spec in favor of Ret. Thank you, Blizzard, for getting something right by way of Dual-spec. Now I can quest as Ret and queue for dungeons as Holy. In honor of the new expansion, I have also chosen a new transmog for my Ret set. Behold! Lawbringer Armor (except I've replaced the set's shoulders with Swiftsteel Shoulders) and my faithfully-hoarded Obsidian Edged Blade from Molten Core. My first attempts at making Pandaren characters have resulted in a new warrior (haven't played my old one in years) and a monk that I am leveling with my husband's monk. I have also faction-changed my goblin shaman (horde-side is lonely on Silver Hand) into a Pandaren shaman with absolutely no regrets. Another new aspect that I'm really enjoying is the pet battle system. This is what I've been doing for the past several days instead of leveling like I'm supposed to. But I can't help it; so addicting! 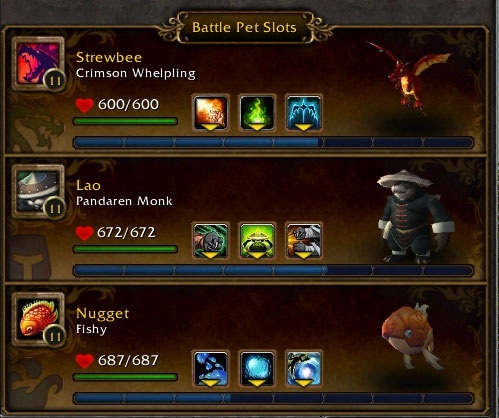 I have well over 100 pets and had some difficulty choosing which three I wanted to raise first. In the end, I chose my Crimson Whelpling, Fishy, and of course my Pandaren Monk. As I close in on level 87, I find that I'm enjoying this expansion much more than the others before it. You might be thinking, "But Rhulain, aren't you biased against this expansion because you're Azn?!" Maybe. It could very well be my Asian lineage that allows me to appreciate the intricacies of this new world. But then again, who cares? I sure don't. All I care about is that the game is fun for me again since Wrath. Back to the level grind!